Every now and again, I find some real gems in unexpected places when it comes to craft supplies. It's no secret how much I love Tiger but recently I've also picked up some pretty awesome things from Poundland of all places! And to be honest with you, I bought a load of other bits from Poundland but by the time I had got round to taking the photos I had used most of it! So here are some of my highlights of bits I've picked up recently that will be ideal for many inspired craft projects. Honestly, I love Tiger. There isn't a store local to me so when I get the opportunity to go to one I get so excited. Oh god, that's sad, but I do! It's one of those places that you can easily spend money in but leave and not remember what you actually bought, mainly because they sell so much random stuff. However, I have always found Tiger brilliant for craft supplies; notebooks, stickers, sketch books, buttons, beads... The list goes on. 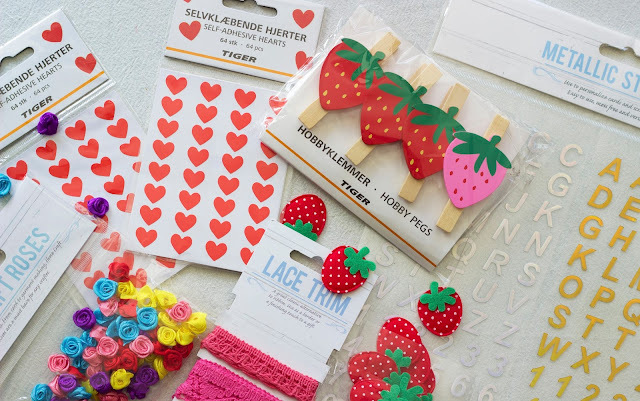 I'm still growing my collection of scrapbook materials so when I saw the squishy strawberry stickers I knew I had to have them. I think they were only a pound as well so such a bargain! 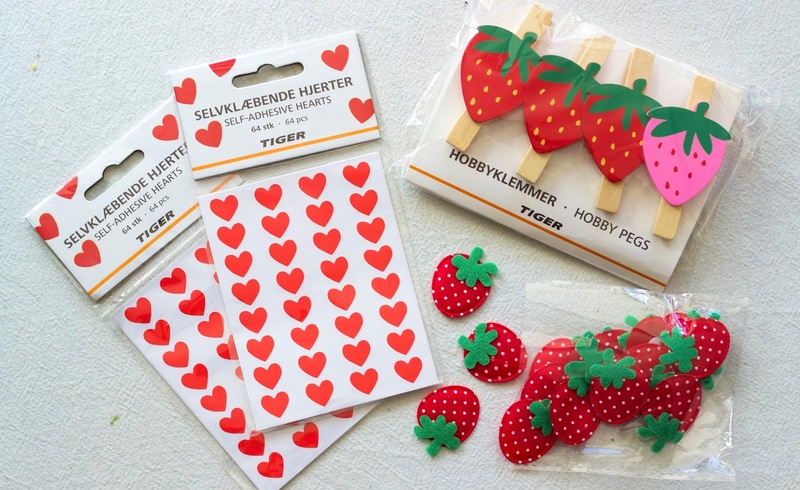 I also got two packs of heart stickers (they were 2 for £1), which will be useful in scrapbooking, card making and lots of other little projects. The last thing I picked up was the adorable set of strawberry pegs. I think I'm going to attach them to a string to hang over my notice board to peg on important letters, invites or things I need to remember! So I mentioned before there is a few bits missing from this haul, I also picked up some fabric squares (which I've put to use already! ), some glitter paper which has been useful for card making and a few other things. I was really impressed when I went into Poundland recently and saw such a vast selection of craft supplies! 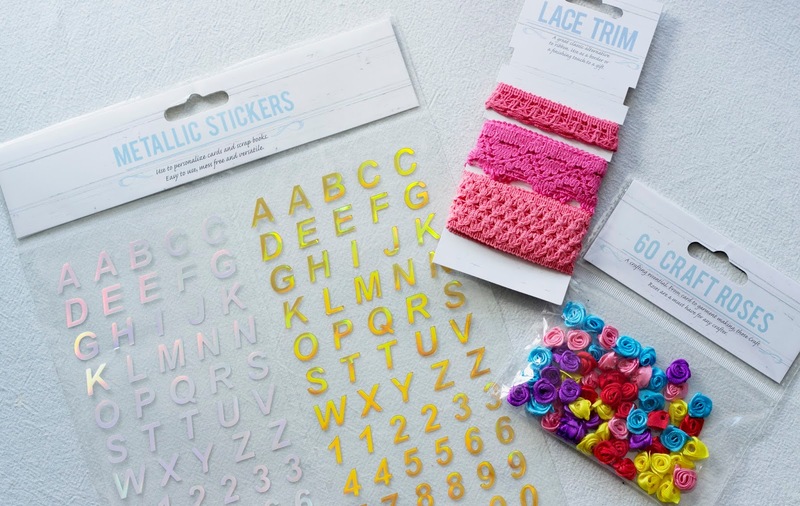 I saw the letter stickers and new I had to have them, they will be perfect for scrapbooking! I also thought like they seemed like something you would find in Paperchase, not Poundland! I thought the craft roses would be nice for sewing on to hair accessories such as hair bows and the lace trim would be a great addition to my fabric accessories. So that's it! Have you picked up any surprisingly good finds from Poundland recently? Or do you have any suggestions of a shop that is worth checking out for craft supplies?